PCTechBytes: Are you a Desktop or Laptop person? These are confusing times for people getting ready to buy a new computer. Will they still be making desktops in a few years? Are tablets just a fad? The iPad and Android-based tablets have exploded in popularity, but are they replacement options for a “real” computer. If you have someone in your life that is ready to go shopping for a new computer, we’ll help you help them make a decision what to get. Operating System aside, we’re basing this comparison on form factor, power and usability. You first need to decide what you’ll be doing with the computer and whether you can survive using a tablet, or if you want to stick with a desktop or laptop computer. 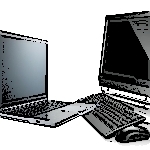 In general, users with have either a laptop or desktop, and a tablet computer to sync it to. Some, however, are discovering they don’t need the processing power of a real computer. They have decided that they can do everything they want to on a tablet. PCTechBytes computer buying advice, desktop buying guide, laptop buying guide. permalink. If my desktop died I would replace it in a heartbeat. My laptop died 6 months ago and I still haven’t replaced it. I guess I am a desktop person. Finally, someone in the computer world that speaks English the way it was designed to be spoken. Thank you Bob for your translations.